Point of Differentiation enables businesses to stand out from their competition. Point of Parity refers to the similarities between you and the competition. Unless you are starting a new, never been seen before kind of business with a completely new category of product or service then you will have competitors and you will have points of parity with these competitors. This is because when two like brands are serving a similar customer then some core needs of the target market will be the same. It is because of the points of parity that we need points of differentiation to make a brand stand out from the rest. Points of parity may include things such as a product functions, features or benefits, a good functioning website, location, value for money, a basic service being met etc. When determining a brands position in the market place you must ensure that the business has desirable points of parity and points of differentiation. Both points are important, you need to know what makes you similar to your competitors and what makes you stand out from these competitors. I’ll paint a picture away from the market place to illustrate Point of Parity and Point of Differentiation and why Point of Differentiation is super important. You are after a puppy and have decided on a Labrador. You view a litter of 7 puppies. Points of parity here are huge; all 7 are labradors, same age, all healthy, 2 eyes, two ears, 4 legs, cute… I could go on and on. But you wish to buy a girl so that Point of Difference cuts the choice down to 4 puppies. One is sleeping and not interested so they get over looked. The other three are all fun, playful and cute. One jumps up and licks your face then sits on your foot. It has just stood out from the rest. Hello to the new family member. So a pretty easy example to use here but now lets look at these puppies as businesses. These puppies are now Law Firms. All have lawyers but only 4 (the female puppies) say they cover the type of service you are after. The sleeping puppy doesn’t have a website so you discard it. You check out the other three websites which look good (all puppies are cute and healthy) so you give them a call. One in particular (the puppy that licks your face) stands out because of the professional yet friendly person you talk to who exceeds your expectations by offering sound advice and talks to you in a way that makes you feel at ease. The decision is made. The Point of Difference here was the way they made you feel and that got them over the line from the other local firms. In most businesses there are always going to be competitors, your job is to find those points of differentiation to make you stand out and be the ‘puppy’ they pick. You can stand out from your competitors in many ways. Whether it be a price incentive, a loyalty program, proof of your dedication and good work, word of mouth, great reviews, a fantastic website, a good advertising program, a reliable product or a unique brand… There are many ways to be differentiated from your competitors. Why is it important to know your Point Of Differentiation? When points of difference are well articulated and understood, this can become a key communication point that businesses use to express there brand. It can create the unique selling proposition enabling the brand to stand out from the crowd and garnish attention. When done extremely well differentiation can create a completely new product, service or brand that stands completely on its own and hence seem to have no competitors. Apple is one of these brands that comes to mind, while some new technologies are starting to catch up for a long time Apple stood on it’s own. Why? Because it was the most modern, up to date, almost ‘futuristic’, reliable technology available. Samsung has caught up in more recent years but I still class Apple as a cut above the rest. There was a measurable difference between Apple and all of their competitors. So, what makes your business, product, service or brand different from its competition? Why should the next client pick you over the business down the road? How can you use this Point of Differentiation to your advantage? Could your point of differentiation be expressed across your brand and your touch points? These are important questions and will help with business growth. I’ve said it before and I am going to say it again, be consistent! Your points of differentiation will only be beneficial if you are consistent with them. 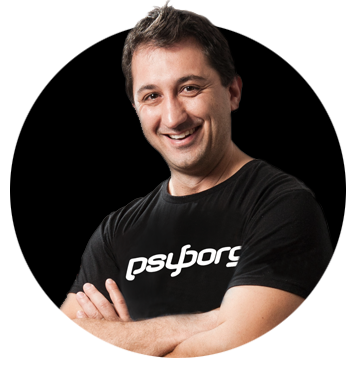 psyborg® was founded by Daniel Borg, an Honours Graduate in Design from the University of Newcastle, NSW, Australia. Daniel also has an Associate Diploma in Industrial Engineering and has experience from within the Engineering & Advertising Industries. Daniel has completed over 2000 design projects consisting of branding, illustration, web design, and printed projects since psyborg® was first founded. psyborg® is located in Lake Macquarie, Newcastle but services business Nation wide. I really do enjoy getting feedback so please let me know your thoughts on this or any of my articles in the comments field or on social media below.